Living mostly at my cabin near Cumberland Falls in Southeastern Kentucky. Spend a lot of time in Michigan with my three daughters and four grandsons. Divorced, but Definitely living the dream, spending plenty of time with family and friends. 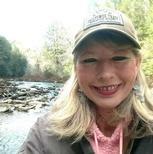 Cynthia Stephens Fairfield updated her profile. View. Cynthia Stephens Fairfield added a photo to her profile gallery. Cynthia Stephens Fairfield changed her profile picture. Cynthia Stephens Fairfield has a birthday today.